- Tuesday and Friday mornings from10:00 am - 12:00 noon in the Senior Center. Do you like to play Canasta, Bridge, Cribbage or any other card game? Come on down and join in the fun. Everyone is welcome! 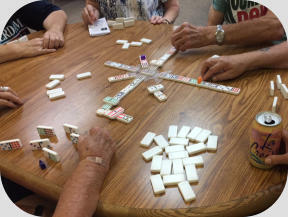 - Wednesday afternoons from 1:30 pm - 3:30 pm in the Senior Center. Do you like to play games like Dominoes, put together puzzles, or color with friends, then come join in the fun, everyone is welcome! - Friday evenings at 7:00 pm in the Scio City Hall, Everyone is welcome.